In short-term insurance, the insurer decides on whether a damaged item such as a car will be repaired or replaced or if a payment will be made as compensation for the loss or damage. Insurer supplies the insured with insurance cover under a policy of insurance, to cover any damage or loss to a delivery truck. The delivery truck is used wholly for taxable supplies by the Insured and the premium payable is R228 per month (including VAT). The truck is subsequently damaged in an accident and the cost of repairs is R12 540 (including VAT). The Insured submits a claim to the Insurer, who undertakes to cover the full cost of the repairs. However, as the Insured is liable for the excess payment of R1 140 in terms of the policy, the insurer will only actually cover the net amount of R11 400 (R12 540 – R1 140). Insurer appoints a Vendor, as the approved service provider to affect the repairs and pays the Vendor directly. Insurer pays Vendor and recovers the excess from the Insured. Premium: deduct input tax of R28 each month in respect of the insurance premiums paid. 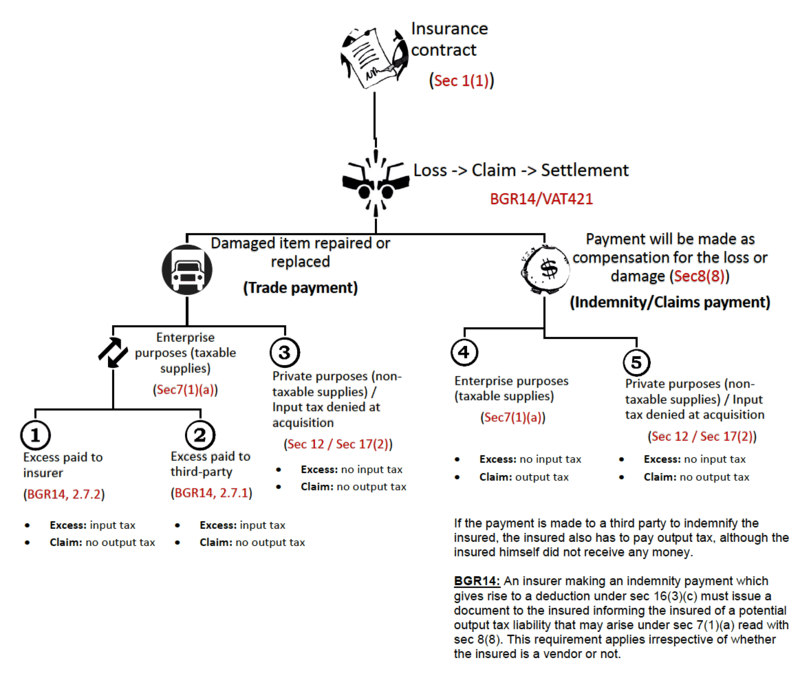 Claim: Insured is not required to account for output tax on the repair of the truck, as the payment for the repairs by Insurer is a trade payment and not an indemnity payment as contemplated in section 8(8). Excess: Insured will be entitled to input tax of R140 (R1 140 × 14/114) on the excess payment made to Insurer under the sec 72 arrangement in Binding General Ruling 14. Insured must however obtain the required document from Insurer to substantiate the input tax deduction. However, as the Insured is liable for the excess payment of R1 140 in terms of the policy, the insurer will only actually cover the net amount of R11 400 (R12 540 – R1 140). Insurer appoints a Vendor, as the approved service provider to affect the repairs and pays the Vendor directly. The Insured pays the excess amount of R1 140 to the Vendor as required by Insurer. Excess: : Insured will be entitled to input tax of R140 (R1 140 × 14/114) on the excess payment made to Insurer under section 16(3)(a). Insured must however obtain the required document from Vendor to substantiate the input tax deduction as required under section 16(2). Vendor must issue one tax invoice to Insurer for a consideration of R11 400 and another tax invoice to Insured for a consideration of R1 140. Manufacturers Ltd recently suffered a robbery at its premises. Their insurance company replaced the passenger vehicle stolen (input tax was denied with purchase) worth R100 000. Claim: Passenger vehicle (motor car) total reinstatement of goods where input tax originally denied - thus no output tax liability. Excess: No input tax may be deducted on the excess amount of R1 140 which was deducted from the total claim amount, as it does not constitute consideration paid for any taxable supply. The truck is subsequently damaged in an accident and the cost of repairs is R12 540 (including VAT). The Insured submits a claim to the Insurer, were the Insurer decides to make an indemnity payment to the Insured to settle the claim instead of having the truck repaired. However, as the Insured is liable for the excess payment of R1 140 in terms of the policy, the insurer will only actually cover the net amount of R11 400 (R12 540 – R1 140). Claim: Output tax of R1 400 (R11 400 × 14 / 114) must be declared under section 8(8) on the indemnity payment of R11 400 as the payment was received in respect of an enterprise asset. -	Fitting on which input tax could be claimed in the past, output tax of R11 495 (R93 600 x 14/114) must be accounted for. -	Passenger vehicle (motor car) total reinstatement of goods where input tax originally denied - thus no output tax liability.